A future parliamentary coalition is open to all pro-European democratic forces, the Bloc of Petro Poroshenko has said. 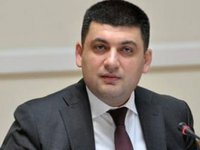 "Yesterday there was a meeting that was attended by the president and at which it was agreed that our political force, the People's Front and Samopomich will form a joint trilateral group and that we will begin professional talks on our joint work, including on the drafting of a coalition agreement," a parliamentary candidate from the Bloc of Petro Poroshenko, Deputy Prime Minister Volodymyr Hroisman, said on Friday. He added that Bloc of Petro Poroshenko was open to other democratic forces in the context of them joining the coalition, including Batkivschyna and the Radical Party. "These are political forces who were elected by the Ukrainian people, and we are absolutely united to create a strong pro-European reformist majority, as it is very necessary to us," he said. He also said that the final wording of the coalition agreement must be agreed before the first session of parliament. "It should be a common and clear document," Hroisman said.